We provide certified instructors, modern equipment including special training gliders, harnesses, reserve parachutes, radios & helmets. After your course, we will not "kick you out of the nest". Some schools function like a production line factory and try to pump students through as fast as possible. With us, you become part of our flying family and you're always welcome back, without having to always open your wallet. We won't mind if you purchase equipment from other vendors, it's a free market and that is your prerogative. 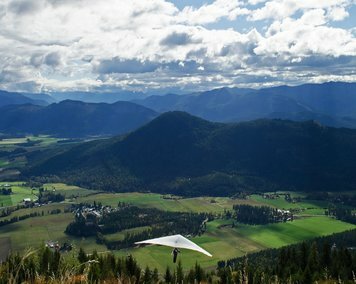 Our site has hosted the Canadian Hang Gliding Nationals multiple times, with the last event in 2015...it must be a great place to fly! It's just a damn fun place! 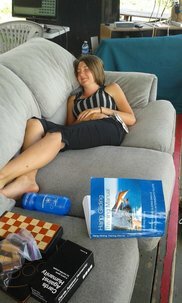 You have decided that hang gliding interests you but you don't want to commit to a full course yet...then a training hill introduction lesson is what you want. This course will allow you to get a better understanding of the details involved and with this understanding, clarify whether the desire is there to commit to achieving a beginner or novice rating. Note: The cost of the introduction course is deducted from your H1 or H2 course should you decide to continue on with your certification. The aim of this course is to learn and taste the basics of free flight and to learn to consistently launch, fly and land a hang glider with confidence from our on site training hill in light wind conditions. You begin with a 2-4 sessions on the training hill for your takeoff training. Next you will take 1 or 2 motorized trike flights and once you are at altitude, the instructor will allow you to take the controls and you will learn the basics of flying a hang glider. At some point in the course there will be a ground school class to round out your understanding and knowledge of the sport. Finally you will do at least a couple of towing sessions. A towing rig is situated at one end of the runway with a line connected to you at the other end. Initially you will "moon walk", only flying 10-15 feet off of the deck. Eventually you will be flying 50-100 feet high and releasing the tow line to come in and land. This is an important piece of the puzzle: your landing training. You can choose to take this course at your own pace as we normally charge by the lesson. The number of lessons will depend on the student's ability, physical fitness, currency (how often between lessons) and other factors. Here are the typically number of lessons:Expect the total cost of the lessons to obtain your H1 rating to be around $1500-2400. If you are in good physical condition and the weather is favorable, you can complete all the necessary lessons in 3-7 days of full immersion, high intensity training. Ideally for this situation you camp near the Freedom Flight Park to soak in the flying atmosphere and glean knowledge from experienced pilots while hanging around the campfire in the evening. ​This is a realistic simulation of a real launch with a little taste of flight and the landing. 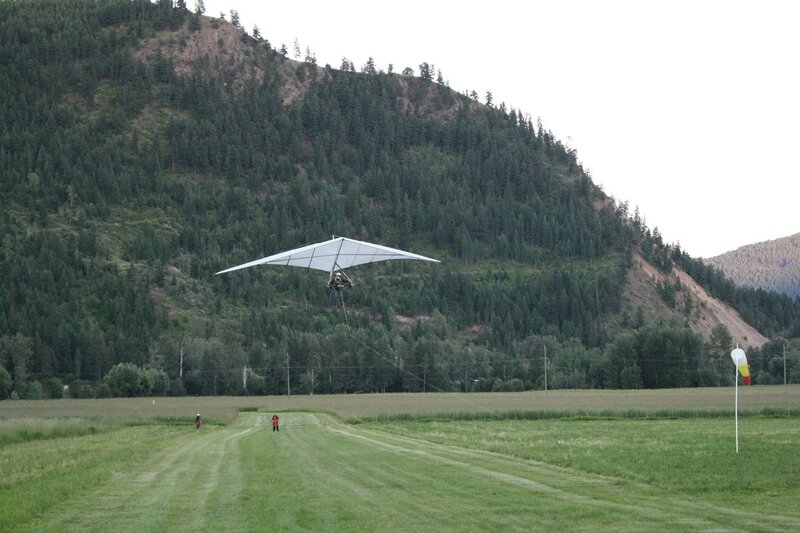 A large part of your initial training will be learning to run down a small slope with a large training glider. If done properly, you can experience your first baby flights lasting 5-7 seconds and 5-10 feet above the ground. 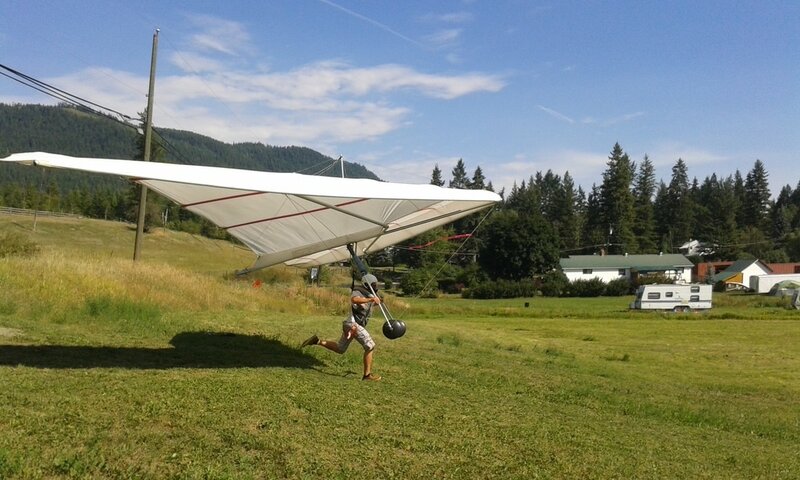 Essentially you are learning the "launching" part of hang gliding. Most students require 2-4 sessions depending on their endurance and speed of picking up the necessary skills. The student (in the back) taking the controls. After showing competency on the training hill, you will take one or two flights with the senior instructor for a 20-30 minute motorized trike flight. The controls are similar to that of a hang glider so you will learning how to maneuver the wing in flight. Most students do 1 or 2 flights. ​​With the aid of a scooter tow system, you will be pulled down a level grass runway. At first you will only go up 10 feet, but later you will be towed up around a hundred feet. Most students require 3-5 towing sessions. ​Throughout the course, as you are learning these practical skills, your instructor will be infusing you with theoretical knowledge about hang gliding, the equipment, free flight, meteorology and other related flying topics. Once the student feel prepared enough, they can write the H1 test from HPAC. Now you are ready for your first high flight. Once you complete this course, you can fly without the presence of an instructor. You will have a solid foundation about hang gliding to move onto your intermediate rating with confidence. In order to meet HPAC's criteria, you must perform 10 high flights (500 feet or more of vertical) and a number of smaller flights, most of which you will have completed in your H1 course. You may need to take an additional training hill, towing session or powered trike flight should it be deemed that you require a little brushing up on your skills. ​For your high flights you will have an instructor to help you up on launch and another one in the landing field to guide you in via a radio if necessary. Congratulations! You have experienced being a bird!!! There is additional ground schooling and an H2 test set by HPAC that you must pass as part of the certification. Price depends on previous experience, students age, physical fitness and time between lessons. Expect the course to cost around $1600. Have you recently moved to Canada and you need to be certified by HPAC but have been flying for years? Or you haven't flown for years and need to recertify? Perhaps you're ready to obtain your H3 or H4 rating and just need to be checked out and write the test. Classes run from May to October.